Since I started to invest in dividend growth stocks in 2009 I have been able to increase my dividend income each year. I purchased an investment property in 2013 for rental income to diversify my income stream, but I still perceive dividends as my main source of income going into retirement. 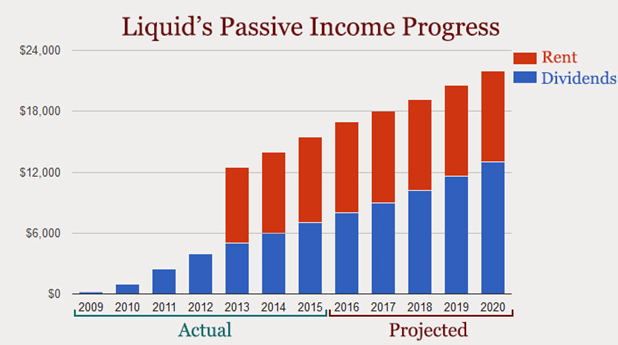 My medium term goal is to make $22,000 in gross annual passive income in the year 2020. To better understand the tangible benefits of dividend growth investing I often like to think about my dividend income as a subsidy for my living expenses. To demonstrate this point, we can use a hypothetical example with AT&T (NYSE:T) which is a large telecommunications company in the U.S. Many people use AT&T as their cell phone provider. Let’s say our phone bill costs $50 a month, or $600 a year. We currently don’t have any investments but our long term goal is to make enough income from AT&T dividends to completely pay for the cost of our phone. All we need to do is set aside the same amount of money each year to invest in AT&T shares as our cell phone expense. This is a very small financial commitment because if we can afford a $50 phone plan, then it shouldn’t be hard to save an extra $50/month. By investing $600 into AT&T shares today at $39/share, we would purchase about 15 shares of the stock. This means in 10 years we would accumulate 150 shares of AT&T. With a dividend yield of 5%, we would receive about $300 a year in dividend payments. If we apply this income to our phone plan it would be the same as receiving a 50% discount on the $600 annual bill. If we continue to invest the same way, then in another 10 years, the discount would be all the way at 100%. So in a total of 20 years, this strategy should allow us to make enough passive income from AT&T shares to pay our AT&T phone bill completely. This essentially means we get free phone service for the rest of our lives. An extra benefit is that we would also hold 300 shares (or roughly $11,700 worth) of equity interest in a highly profitable business that has a wide moat and a history of earnings and dividend growth. So we’ll have the option to do whatever we please with this asset at any time in the future. This framework applies to any cell phone plan. If our plan costs $100 a month for example, we would simply buy $100 worth of AT&T shares a month on average. As long as we invest the same amount of money each year as the total cost of our wireless service, then our phone bill should be 100% covered by our dividend income in 20 years. 20 years seems like a long time, but it will come to pass eventually. And when it does I would prefer to have my wireless service fees be paid in full by the same wireless provider that I use. This is a perfect hedge against the rising cost of cell phone plans. The more money AT&T charges its customers, the more profit it will make for its shareholders in the form of stock appreciation and dividend increases. There are a lot more AT&T customers than shareholders so the odds are in favor of the investor. The rising stock price may limit how many shares we can acquire over time, but chances are that dividends will increase as well. Over the past 20 years AT&T shares have appreciated by about 55% in value. But its quarterly dividend distribution to shareholders has increased by roughly 123% over the same time period, which is a big win for dividend growth investors. Besides, it’s not necessarily a bad thing when the stock we buy goes up in price. And if we decide to reinvest all our dividends back into AT&T then we could reach our goal even faster. What all this means is even though there are many factors that cannot be predicted, it is more likely than not we could have 100% of our cell phone plan paid for in less than 20 years. And since dividend growth stocks tend to increase their distributions faster than the rate of inflation, we don’t have to worry about the long term effects of currency devaluation as long as we are living off this dividend income. No matter what our investment strategy may be the important thing is to have a solid understanding of the assets we are invested in. Understanding removes uncertainty and creates confidence. This leads to a sense of control that will give us peace of mind. As long as we have clear targets in mind and take necessary actions we should eventually achieve our goals.